The 30 ml bottle is made out of PET, it’s transparent so you can better enjoy the vivid colors, and has a beautiful printed black cap which elegantly finishes its silhouette. 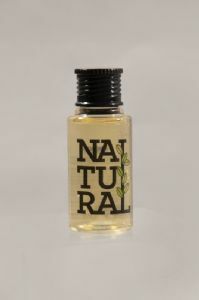 The liquid has a Ginseng fragrance along with Ginseng Extracts. The Taylor of London Natural Eco-Aware collection of hotel toiletries is a playful and joyful hotel cosmetic range due to the pastel colors that are found in the liquids. All in all, the Natural line is a spoiler for the customer’s senses. It has not only a great design due to the joyful, but tempered colors of the liquids, but also provides a truly delight for the body and hair during shower experience.